The 19-year-old Italian forward for Juventus F.C. scored a goal in the 85th minute of yesterday’s match against Cagliari, and his celebration caused controversy. Following his goal, he stood facing the crowd, who were yelling racist things at the opposing players the entire match, with his arms in the air. His response caused the soccer world to explode, as well as controversial comments from his teammate Leonardo Bonnuci. “There were racist jeers after the goal, Blaise heard it and was angered. 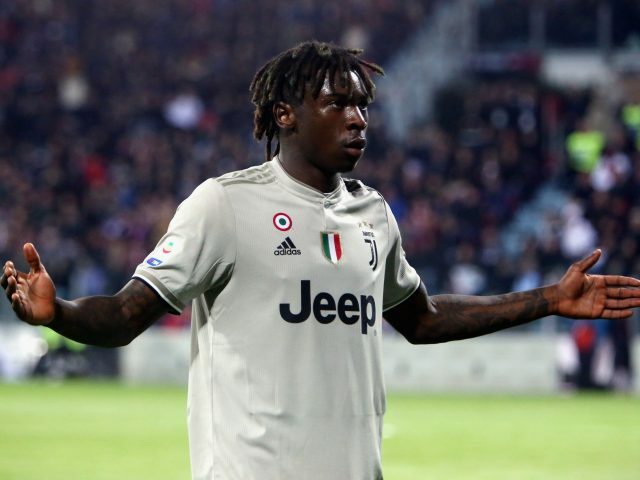 I think the blame is 50-50 because Moise shouldn’t have celebrated like that and the Curva should not have reacted that way,” the Juventus defender said after the game. But the support from athletes across the world has overpowered the comments from his own teammates, most notably Manchester City F.C.’s Raheem Sterling supporting Kean. Sterling is well known for standing up to the racial abuse he has received while playing in England. Sterling posted “The blame is 50-50 @BonnuciLeo19. All you can do is laugh now,” on his Instagram story, in response to the comments by Bonucci. Manchester United’s Paul Pogba made comments following the events, stating “I support every fight against racism, we’re all equal,” and Olympique Lyon’s Memphis Depay stated “It’s a shame we still talk about racism in 2019! But we have to speak up! We all equal #NoToRacism” on his social media. Kean’s celebration is another example of the stance players have taken against racism in not only the world of soccer but the world of sports as a whole.